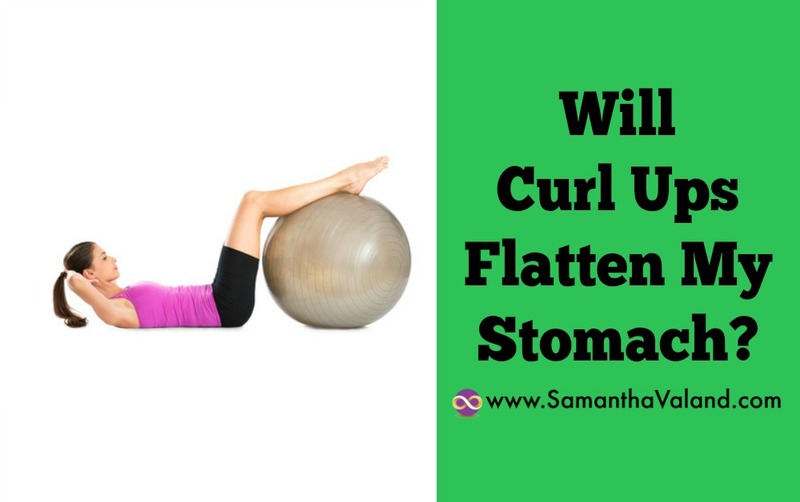 Will Curl Ups Flatten My Stomach? An expanding midriff is often the bane of most menopausal women’s life and is usually very stubborn to shift. Exercising is one piece in the puzzle that can help, but are curl ups the best exercise to flatten your stomach? 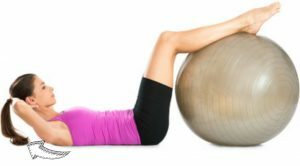 In Pilates, the curl up exercise is a foundational exercise for more advanced Pilates exercises. However, because it is such a simple one it is often overlooked and performed incorrectly. The increasing use of technology has changed our posture. We are often looking down rather than straight ahead. On a mat, this translates into only taking our heads off the mat and not our shoulders as demonstrated by the image. You may thinks she looks good, but with my Pilates goggles on, she has only lifted her head and neck off the mat. If she was in my class I would have encourage her to curl up more so that the top of her shoulders not covered by her top was off the mat, as shown by the arrow movement. This ‘lift off’ position rather than ‘curl up’ often leads to neck and shoulder stress when the exercise is performed incorrectly on a regular basis incorrectly. Any reasons why I should not perform a curl up? If you any bone issues such as osteoporosis or osteopenia then the curl up exercise is one that is contra-indicated for you and you should ask for alternatives in your class. What else can affect your midriff in your menopausal years? We spend a lot of time sitting these days, which can affect the strength in our muscles. Participants having a sore back is the most frequent comments I get when teaching a Pilates class. However, there is rarely a diagnosis just a catch all of ‘weak core’. The curl up exercise does little to improve this. We would be ideally looking at exercises that engage a muscle called ‘transverse abdominals’ which as the name suggest, wrap around in a corset like fashion. Digestion problems may occur during the menopause. If you have a sluggish digestion or suffer from bloating, your tummy may be distended making your clothes feel tight and uncomfortable. This can also affect your posture as well and your lower back position. Often looking at this as a starting point and going to your doctor or healthcare provider can be more helpful. Some of us hold our stress in our tummy – “don’t have the stomach for it” and reducing our stress levels can help reduce bloating and the size of our midriff. Excess stress hormones are stored around our abdomens. It can often be hard to shift and the traditionally ‘eat less, exercise more’ usually does not have any impact on it. We become more sensitive to stress in our menopausal years, so learning to reduce your stress levels with restorative activities is usually the best approach to help flatten your stomach. If you eat more calories than your body needs then you will start to put on weight. You can pop over to my website for a calculator that will give you an idea of how many calories based on your activity levels. In our menopausal years, we become more sensitive to sugar, coupled with increased stress levels it can all go straight to our midriffs. As carbohydrates are our energy source, it can be trial and error to work out how much we need. Too much will increase our midriff and weight too little will affect our energy levels. An exercise such as curl ups does not burn enough calories to make a significant difference and cardiovascular exercise does not ‘spot reduce’ specific areas. If you asked a Pilates Teacher, they would probably say the curl up is a worthwhile exercise if you are a regular to Pilates and want to progress further as it is one of the foundation exercises. Progressing to more advanced exercises will help strengthen your core. As an exercise on its own, with the sole purpose of a flat tummy, then it is not the best choice, in my humble opinion. If you asked a Personal Trainer, they would probably tell you that a flat tummy was made in the kitchen and not in the gym. Look to your food choices first. Did you flatten your menopausal tummy? Was it through stress management, food or exercise? I would love to know.